Boutique hotels are all the rage these days, with their handful of rooms perfect for a romantic break and home-away-from-home feel. But we've found the hotels that take 'boutique' to the next level - the cosy yet luxurious abodes with just one room or up to four. Copenhagen's Central Hotel & Cafe opened in summer 2013 and was named the world's smallest hotel. The cute one-room hotel has a small cafe, a bathroom with shower, a stereo to connect your iPhone and free WiFi. The £170-a-night hotel in the Vesterbro neighbourhood brings new meaning to the word 'boutique', with its attention to detail - think fresh flowers, a minibar stocked with the best treats and luxurious bed linen. Exclusive one-room hotel On the Altar (Op Het Altaar) is located close to Rembrandt Square in the heart of Amsterdam and set in a former Catholic chapel built in 1751. The 350-euro-a-night hotel is shielded from the city noises and tucked away in a small, quiet side street. It was once used as a "shelter church" during the time of persecution of the Catholic people, hence its location. The bedroom doubles up as a living room and is in the main chapel, while the toilet and bathroom is on the second floor. Guests can enjoy modern features, such as a TV and DVD, WiFi and a self-catering kitchen (with free coffee and juice). While it may be one of the world's smallest hotels, the historic chapel has a large luxurious bed with high ceilings creating space. Fancy a stay at a one-room No-tell? The Harrington in Brighton is a private hotel where the only guests are you, there's no staff and booking is confidential. You won't find room service at the £190-a-night-hotel, but The Harrington can arrange tickets to shows, a butler or massages. The silver-leafed front doors lead to a winding staircase taking you up to a coffee area and through to the chapel bedroom with its 15ft-high barrel ceiling and stained glass window with views of the famous Pavilion estate. With just three luxury boutique rooms, The Oyster Inn, the creation of designer Jonathan Rutherfurd Best, lies just 40 minutes from downtown Auckland and offers a renowned seafood restaurant, bars and beach shops. The hotel is equipped with a vintage VW taxicab bus for excursions and collecting guests from the ferry terminal, as well as a Fish & Chippery take-away window open at all times. Guests are presented with oysters and champagne upon arrival and a limited-edition pair of yellow and white Havaianas. Each of the three rooms include merino wool blankets, complimentary breakfast, super king beds, waffle cotton bathrobes and free WiFi, from £146 per night. Standing at the end of a jetty in the city of Alesund, the 150-year-old Molja Lighthouse (from £480 per night) measures just three metres and has its own compact bathroom, circular bedroom with custom-fitted bed and lovely views west towards Godoy Island and the Atlantic. The lighthouse, also known as Room 47 as it is part of Hotel Brosundet just a five-minute walk away, still has its red and green beacon guiding ships into the sheltered waters. This chic hotel for two has just one room and a roof terrace overlooking the bustling old town of Siem Reap. The £160-a-night One Hotel might just have one room but there's everything you'll need on your holiday - a big bedroom with a contemporary bed covered in Frette linen, a bathroom with a sunken Terrazzo bath and deluge shower, plus a roof terrace with a daybed, Jacuzzi and surround system for hanging out. Its facilities are limited to just 600 square metres of surface in a nine-metre-tall building, but Hotel Puntagrande is one of the most original and impressive hotels around. With only four double rooms (from 74 euros per night) and set on a small wave-swept jetty on the most remote of the Canary Islands, El Hierro, the hotel is decorated with ship and wreck scraps, compasses, lanterns and even a diving suit displayed in the dining hall. The bedrooms are simple and without TVs or minibars, but with unique features, such as number 2, which has a terrace to throw a fishing line. One of the smallest hotels in the world, Eh'hausl, is a magnificent home from home with opulent interiors, a red saloon, spa-style bath floor and a fireplace room. Located in Amberg, Eh'hausl (from 240 euros per night), is a five-star one-room hotel set up on six floors with all the features of a luxury hotel. 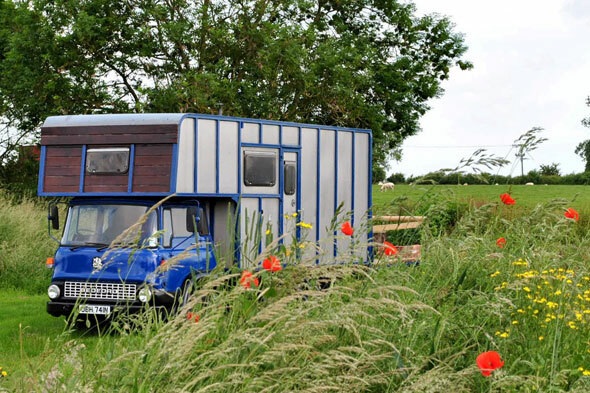 Converted by cash-strapped farmers in Banbury, Oxfordshire, this battered old horsebox is now a £100-a-night hotel, complete with a double room above the driver's cab, a woodburner and antique furniture. The 1974 Bedford TK is parked in a corner of owners Paul and Anne's farm and boasts stunning views over the Oxfordshire countryside. The unique hotel can sleep up to four guests, and while the horsebox doesn't include an en-suite bathroom, it does have a small decking area outside with a composting toilet and shower. Set in a 13th-century medieval tower within the Roero di Monteu Palace in the old town centre of Asti, Rotarius B&B is a one-suite hotel furnished with period antiques and interiors that boasts old-fashioned elegance and discretion. The 310-euro-a-night hotel for two is reached by going up 62 steps and once at the top you'll be met by a king-sized bed, a plasma TV, free minibar and spectacular views of the old town and the Piedmont mountains. The world's most unusual hotels: would you stay here?